ssistance League offers a variety of opportunities for members to make a difference in our community … join a puppet troupe, read to a child, distribute school uniforms, or participate in a sing-along at a nursing home or in an assisted living facility. The time you spend in these volunteer activities is guaranteed to promote positive change and put a smile on your face. Voting members are asked to participate in at least one program of their choice and encouraged to serve on a committee. They attend monthly chapter meetings the second Thursday of each month, excluding July and August, and support our fundraising projects. Dues are $60 per year. Membership is open to those who wish to provide service to the community and who want to experience the inner reward that comes from helping others. At an orientation session, new members learn the history and programs of Assistance League. Last year, our members provided over 7,800 hours of volunteer service in the local community. Membership Form for 2019-2020 and Member Skills Form. Thank you! If you have questions about Assistance League of the Chesapeake, please email us! “As volunteers we don’t always see the difference we’ve made in the lives of the students we serve. For our Operation School Bell Literacy program, Assistance League of the Chesapeake and community volunteers have been manning the Chessie reading program at Meade Heights Elementary in Ft. Meade, Md., for several years now. “Students in grades 1–3 may participate by selecting a specially designated Chessie book each week, reading for comprehension and then answering questions. Recognition and small incentives are given for every five books completed, and their enthusiasm and pride at each accomplished level is contagious. “Last year both 1st grades participated in the program along with 2nd and 3rd graders, but only one of the classes had full participation, while in the other class less than half of the students participated. When the staff evaluated the students in the fall and again in the spring, they found that 1st grade students who had participated in the Chessie program were reading two levels higher in the spring than the students who hadn’t participated! 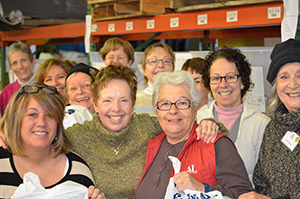 Assistance League appreciates the help of community volunteers. For information on volunteer opportunities for individuals or groups, contact VP Philanthropic. Dues are $60 per year for voting members and $100 for nonvoting members. New members are responsible for a one-time $5 orientation fee.